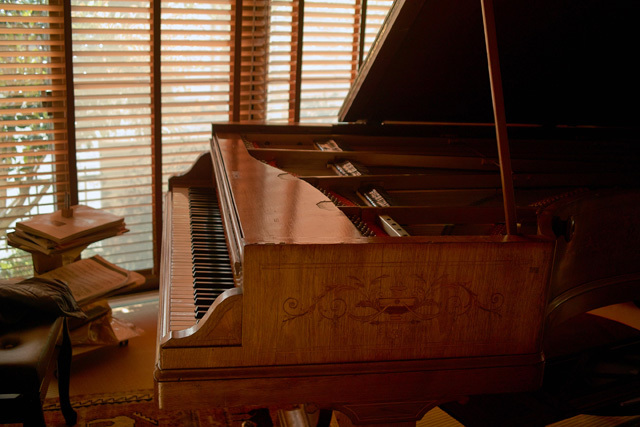 I have added some photos of the piano to Camera Obsession, my photo gallery. I have played various music which I believed sounds well on the instrument. Chopin sounds well, so are Mozart, Schubert, Schumann, Beethoven, Bach, Ravel, and Faure. I started working on Brahms, whose music also sounds beautiful on it. Every note just sounds clean, and you can hear the harmonic structure crystal clear. I have got some insights into the music by Ravel, whose music may be obscured when played on contemporary pianos with full, rich tone. He is in a sense classic. So is Chopin as he claimed for himself. It can be heard by the tone with lesser use of the sustain pedal. Schumann rather sounds creasy, but I love his music as well. He must have excited his contemporary audience with its rich harmonics produced by a frequent use of the sustain pedal. He is really different from any other composers preceding him. Some write that Chopin was sarcastic on his music, but he might have been jealous to the innovative tonality heard in Schumann’s excessive compositions. yeah, the instrument teaches me a lot and I am never bored on it.